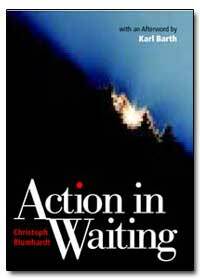 Excerpt: Acclaim for Action in Waiting, Rodney Clapp, author; A Peculiar People Pulse-quickening ? In plain but vibrant language, Blumhardt reminds us that personal peace is merely the wrapping paper of a greater, even more magnificent gift: confidence in the coming of God?s kingdom. Clark Pinnock, author, The Flame of Love Blumhardt is filled with hope about the power of God to transform the world in concrete ways ? His is a holy optimism grounded not in human prowess but in the triumphant grace of God. Donald G. Bloesch, author, Wellsprings of Renewal The modern church needs to hear this social prophet. Here is a summons to act in confidence and courage in the firm expectation that God?s kingdom is at hand. Robert Webber, author, People of the Truth Proclaims a message that is indispensable for postmodern Christianity: Jesus is victor over all the powers and we, the people of God, are called to live out the politics radically. Vernard Eller, author, Christian Anarchy Blumhardt believes that God can make ?all? things new. He challenges us to participate in this newness and devote ourselves to it.